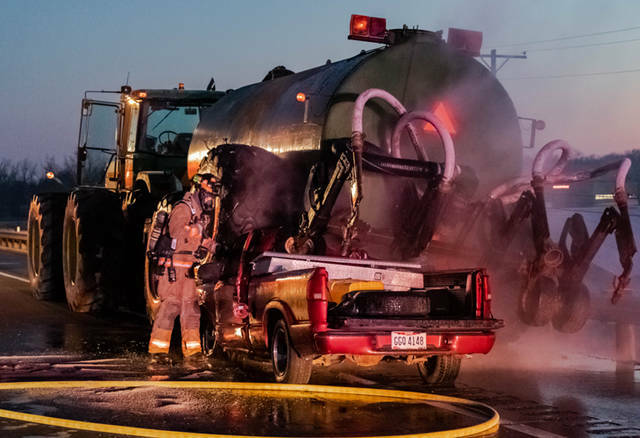 A red Chevy S10 collided into the rear of farm machinery, causing the vehicle to become pinned under the equipment. 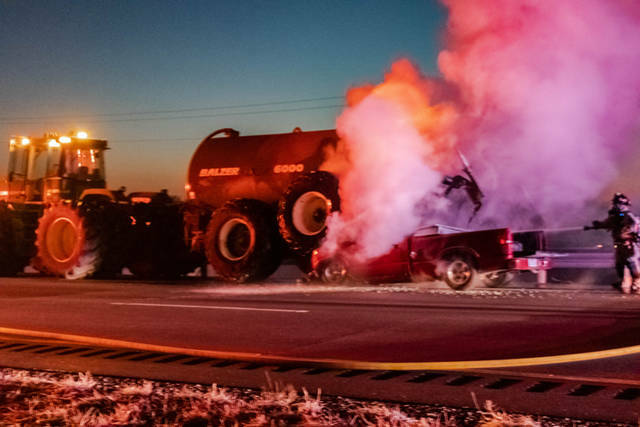 GREENVILLE – A driver narrowly escaped serious injury early Monday morning when the vehicle he was driving collided into the rear of farm machinery, causing his vehicle to burst into flames. At approximately 7 a.m., emergency personnel from Greenville Township Fire and Rescue along with Greenville City Fire as well as Greenville Police Department and Darke County Sheriff’s Department were dispatched to northbound U.S. Route 127 in the area of U.S. Route 36 East in regards to an injury accident involving a vehicle pinned under a piece of farm machinery. 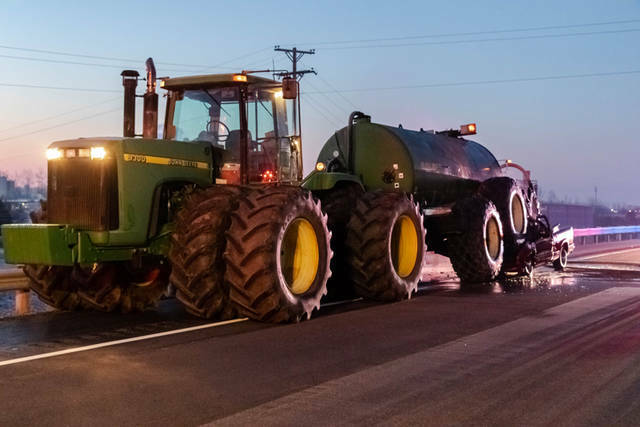 According to the Greenville Police Department, preliminary investigations revealed a green John Deere 9300 was traveling northbound on U.S. Route 127, pulling a 6,000 gallon Balzer 6000 Magnum Slurry Tank filled with water. 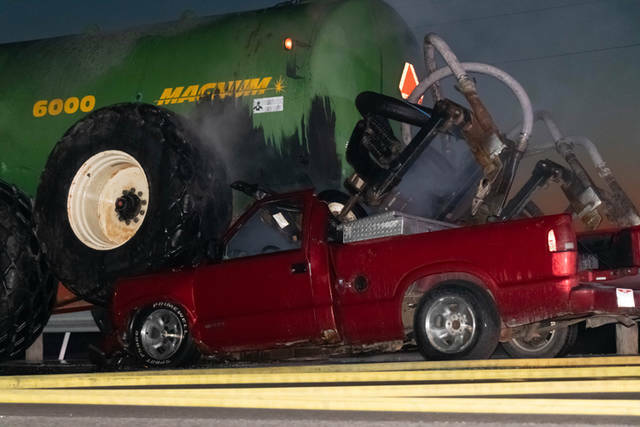 A red Chevy S10, also traveling northbound on U.S. Route 127, failed to notice and stop in time before colliding into the rear of the farm machinery, causing the vehicle to become pinned under the equipment. 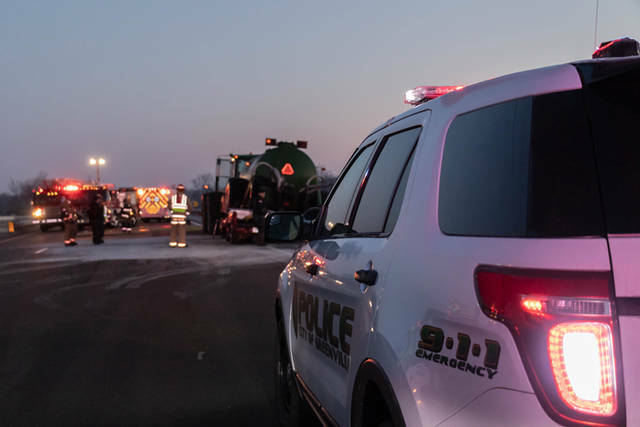 U.S. Route 127 was closed to all northbound traffic from Sebring-Warner Road to U.S. Route 36 East while officers from the Greenville Police Department investigated the accident and crews worked to remove the wreckage from the roadway. The accident will remain under investigation by the Greenville City Police Department. This entry was tagged crash, Darke County Sheriff’s Department, Darke County Sheriff’s Office, Greenville City Fire Department, Greenville Fire Department, Greenville Police Department, Greenville Township Fire and Rescue, Greenville Township Fire Department, Greenville Township Rescue, John Deere, Wayne HealthCare. Bookmark the permalink.